1. 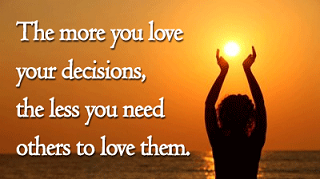 The more you love your decisions, the less you need others to love them. 2. Recognize that you cannot know with 100% certainty that your decision is correct because the actions to implement it are to take place in the future. So make it and don&apos;t worry about it. 3. Physical bravery is an animal instinct; moral bravery is much higher and truer courage. 4. Make your decisions based on where you&apos;re going and not where you are right now. 5. Only the heart knows the correct answer. 6. The better we understand the choices we have been making, either consciously or unconsciously, the more say we will have in the world we create. Neurocircuitry may be neurocircuitry, but we don&apos;t have to run on automatic. 7. When making a decision you are simply choosing from among alternatives. You are not making a choice between right and wrong. 8. Once the decision has been made, don&apos;t look back. Be aware of how it is currently affecting you and focus on your next move. Never regret a decision. It was the right thing to do at the time. Now focus on what is right at this time. 9. What’s right for most people in most situations isn’t right for everyone in every situation. Real morality lies in following one’s own heart. 10. Once the decision has been made, don&apos;t look back. Be aware of how it is currently affecting you and focus on your next move. Never regret a decision. It was the right thing to do at the time. Now focus on what is right at this time. 11. I think positive. I always think we&apos;re going to score. Two minutes is a lot of time if you have timeouts and you&apos;re throwing every down. You have to make the right decisions. I&apos;ve always had great receivers, which helps. It&apos;s not just me doing it.